Your feature today on Trichotillomania was so thought-provoking and I wondered if my personal experience as a therapist might add something to the detailed discussion you had today. Beckie Brown mentioned that “some people do it subconsciously, some do it unconsciously, some do it in their sleep”. David Eagleman, the neuroscientist who had a series of programmes on BBC recently, speaks of sleep as being when the conscious mind goes off-line and it switches back on again when we wake up. One caller mentioned her daughter responding to being told ‘you’re pulling your hair again with “Am I?” and describing it “as if she’s doing it unconsciously”. 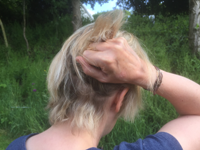 Dr. Sarah Jarvis explained that one of the main and effective treatments for this is Cognitive Behaviour Therapy (CBT) or Habit Reversal Training, aiming to replace the hair-pulling with a less damaging habit. This seems puzzling to me. People either don’t know they’re doing it, or if they know, they can’t stop themselves from doing it, so the conscious mind isn’t in control. As far as I understand it, CBT works with the conscious mind. part of the mind that is in control. Whether we call it subconscious or unconscious, it seems, from all that’s been said so far, that willpower and intention (the conscious resources) can’t help. You, Jeremy, asked, “Why would anyone do it?” Sufferers themselves don’t seem to be able to answer that question in a way that helps them be rid of the habit. Hypnotherapy is a treatment designed to work with the subconscious mind and there is a form of hypnotherapy that has a way of finding an answer to that question, and that answer points to a therapeutic intervention which can and frequently does resolve the unwanted condition right at the roots – just like getting rid of tooth decay so we don’t get toothache any more. doesn’t mean it will stay forever. Again, there is a form of hypnotherapy, the kind that I practise, called Lesserian Curative Hypnotherapy (LCH) which can and does make changes to habits that have been in place for many years. One of my clients had a plate-clearing habit since she was a young girl in the 1950’s when rationing was only just beginning to be replaced by plentiful food in the shops so no-one was allowed to waste anything. After successful treatment, she one day noticed that she had been leaving food on her plate at the end of meals – no effort – it was just happening automatically. Whether this is of interest to yourself and your programme or not, if you think that any of this might help any of the callers who contacted you about the condition, please pass on any of this information to them. Many thanks, again, for a detailed and informative feature on this serious and distressing condition, and I’m sure sufferers will have benefitted from all the contributions.